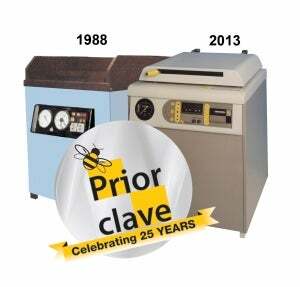 Top-loading laboratory autoclaves are the longest serving stalwarts of the Priorclave steam steriliser range, a 100l model being the first produced and to leave the company’s factory in 1988 when it started trading, and through dedicated service and support many of these early models can still be found in use today, performing routine sterilisation processes some 25 years later. Throughout the 25 years top loading autoclaves have become acknowledged as an extremely versatile and flexible autoclave, its top loading design and easy chamber access enabling small and tall objects to sit side-by-side during a single sterilising process. Despite popularity of the early top loading autoclave, Priorclave recognised laboratory demands where changing and re-engineered the initial steriliser to create a more robust design with improved control technology, at the same time introducing a new body style. The new look culminated in the launch of a new range for the 21st century, QCS top loading Priorclaves, and these have become an integral part of the current and comprehensive range of steam sterilisers manufactured in the UK. Today, the extended top-loading Priorclave QCS range comprises 100l and 150l models, available standard or with vacuum assisted drying and with a choice of electrical, direct steam heating or supplied with an integral steam generator. Each model is designed to afford the ultimate in steam sterilisation, with proven reliability and repeatable performance and a superior build quality. In addition to choice of chamber sizes of 500mm diameter and depths of 500mm and 720mm, the overall compact footprint of each model in the QCS top-loading range ensures it is a contender for any laboratory even those where floor-space is limited. Performance and safety are at the heart of all Priorclaves. Standard throughout the entire range of autoclaves are Quickseal singe-action doors fitted with thermal and pressure locks to prevent door opening at elevated pressure and temperature whilst TACTROL 2 centralised microprocessor controllers offer unrivalled flexibility in setting simple or fully featured programmes as well as monitoring process status. A full log of autoclave activity is held in the system and can be downloaded when required. A special epoxy finish proven to reduce bacterial growth by up to 99.99% is applied to all panels and frame members to prevent potential for cross-contaminations and spread of disease within the laboratory and its staff. Treated products are highly effective against MRSA, E.coli, listeria, legionella, campylobacter, salmonella, pseudomonas and many other species. QCS top-loading autoclaves are part of a comprehensive range steam sterilisers that includes compact benchtop, free-standing, front and top loading autoclaves, circular or rectangular sterilising chambers, choice of electrical, direct steam heating or integrated steam generator models in standard capacities up to 700l.